Our twenty-first century world is populated by a vast mix of religions and philosophies each claiming truth and that they can provide you with meaning and happiness. In contrast we have the claim of biblical Christianity that there is only one Truth, only one reality and only one God who exists and has spoken to us. By speaking to us God has informed us of the nature of reality and that happiness, purpose and meaning in life can only be realized when we orient our thinking and our lives to this Truth. Jesus said, “You shall know the Truth, and the Truth shall set you free.” (John 8:32). He did not leave us to guess the meaning of Truth. Jesus specified the meaning of his statement twice, He said “I am the Truth” (John 14:6) and further stated that this reality was communicated and articulated in the Bible, God’s Word, “Thy Word is Truth” (John 17:7). The claim of Biblical Christianity is that only by making the Truth of the Bible the foundation for your life can you have happiness, meaning, purpose and fulfill God’s plan for your life—"I came that they may have life, and have it abundantly.” (John 10:10). Video DVDs of these lessons can be ordered here or here. 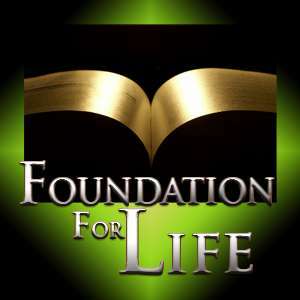 To view all video Bible studies in the Foundation for Life series, click here. 1 - What is your Foundation? 7 - Why Only One Way?